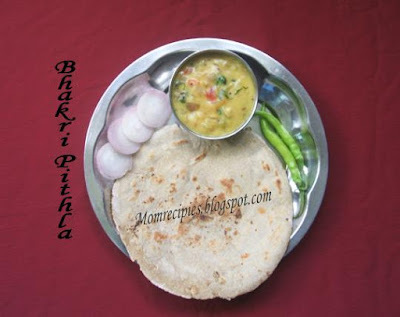 Pithla Bhakri represents a humble and very comfort meal in any Maharashtrain household. Pithla, Bhakri and Thecha served with Green chillies and Raw onion make a fabulous combination.Pithla Bhakri is called as Farmer's meal or poor man's meal in Maharashtra. But because of it's awesome taste and simplicity it got popular among all Maharashtrian households. Pithla is made from besan/chickpea flour and tastes best when eaten with Bhakri which is prepared using Jowar/Bajri flour. Making Pithla is handy when you are either out of stock for veggies. Amma prepared this ideal meal for lunch on Sunday.Like every recipe Pithla has many variations. Here goes the recipe for Pithla. 1) Add besan to water and mix well so as to make it lump free mixture. 2) Heat oil in pan / kadai. 3) Add mustard seeds and cumin seeds. Wait till they splutter and then add green chillies, curry leaves, and chopped garlic. Once the garlic changes to light brown, add the chopped onions. Fry till they become translucent. 4) Add tomato and cook till it turns soft. 5) Now add the besan water mixture and stir well. 7) Cook for 5-10 mins. 8) Garnish with fresh coriander leaves and serve piping hot with Bhakri / Roti / Rice. Tip: - Adjust the besan proportion to the required consistency. Remember that after the Pithla cools, it becomes thicker. i love this..thecha, pitla..you are making me drool ....delicious.. I have neve rhad these , it sounds and looks so yummy. 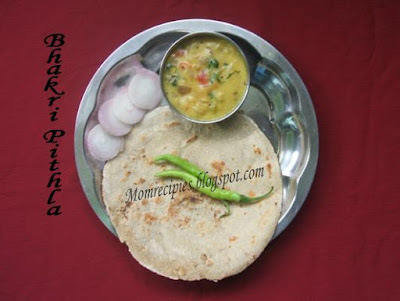 i have heard about bhakri,but pithla is very new to me,thanks for the recipe! Wow,Love the post and the dish which is new to me.Thanks for explaining every small thing.It will be very helpful while making it.Never tried Jowar flour. Never heard about this..really new to me..pithla looks fabulous !! Have so much of this authentic dish but got a chance to have only once! But at that moment I didnt know it was Pithla and couldnt figure out what it was! What a lovely creamy dish. I'm definitely going to try this out! And the bhakri looks perfect too! Liked the idea of serving phitla with Onions and green chilies.... the jowar ka pithla sounds even more healthy!!! feel lik hvin this now,.. I absolutely love this combo!! Wow absolutely a new dish it sounds for me.. I love roti and chapathis. so this one would sure be on my list. here for the first time and love ur dishes. keep it going. Do take a peep at my blog when you find time. mmm. mouth-watering platter Sireesha! All the dishes are completely new to me.. Looks so yummy!! Its new to me. But sounds great.